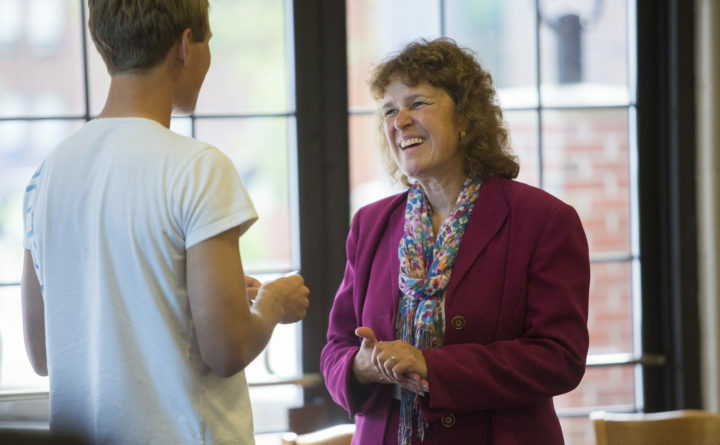 Thomas College President Laurie Lachance talking to a student. Lachance says the college has several programs that help cut tuition costs to make higher education affordable to more students. Thomas College in Waterville thinks it has found ways to cut the cost of a higher education at a time when Maine students are swimming in record high student loan debt, which has almost doubled in the past 10 years. What’s making college more affordable is a combination of dual enrollment courses for college-bound high school students and shaving the number of years it takes to get a bachelor’s or master’s degree, said Laurie Lachance, president of Thomas College. One program, Pathways, lets students earn their high school and college associate degrees at the same time. They graduate from high school with only one more year to go to earn a bachelor’s degree. And the courses are free to the students, paid for with grant money and other programs. That means colleges need to think differently, said Lachance, who is an economist. Thomas College runs as a business, spending only on things it can afford and cutting costs where possible. The cost cutting benefits both the students and the school, she said, pointing to the three-year bachelor’s degree and four-year bachelor’s and master’s degree programs. Normally, a bachelor’s degree takes four years to earn and a master’s degree takes another two years for a total of six years. But Thomas students can shave off a year by taking extra credit hours and summer courses within the three years. “Students can save a full year of college costs and get to the workforce faster,” she said of the bachelor’s program. That comes to $30,000 for one year, including tuition, room and board. The dual college credit program gives students an early taste of college. And they can transfer the credits they earn. About 75 percent of Thomas College students are from Maine, she said, and half of those are from central Maine. Up to 80 percent of graduates stay and work in Maine, again mostly in central Maine. Many colleges in Maine offer an early college experience with dual enrollment, said Thomas Edwards, provost of Thomas College. “Thomas has one of the most extensive systems,” he said. About 40 percent of incoming Thomas College students in 2018 had some early college credit. And 25 percent of incoming students in 2018 opted for a three-year bachelor’s degree, Edwards said. The Pathways program, the only one of its kind in Maine, is a collaboration between Thomas College and Maranacook Community High School in Readfield, a 20-minute drive northwest of Augusta and 40 minutes southwest of Waterville. This year, six students are poised to graduate from the program with both a high school diploma and an associate degree from Thomas. That is the most graduates since the program started in 2016. Maranacook serves the communities of Readfield, Manchester, Mt. Vernon and Wayne. Students must apply to get into the Pathways program, which consists of one week of intensive summer courses at Thomas, online courses delivered by Thomas College faculty and courses delivered at the high school. The high school teachers try to align their syllabus with the college courses to make the learning efficient for the student. Pathways and dual-enrollment courses help the many Maranacook students who are the first generation in their families to attend college. “The dual courses help students who don’t get wisdom about college from their family,” he said. The dual-credit courses are with Thomas, the University of Maine at Augusta, Kennebec Valley Community College and St. Joseph’s College. And last year Thomas College started a new program to help with books, which can cost up to $1,000 for the semester. The college is redesigning 30 courses over three years to eliminate book costs by relying on free, online resources. The project, paid for with grant money from the Davis Educational Foundation, is expected to save students more than $200,000 combined over the three years.